New country! The border passage went real smooth; it took us only one hour. We had to use our Carnet de Passage even though it is not supposed to be valid in Cambodia. In no mans land in between the borders we switched from driving on the left side of the road to the right side of the road. 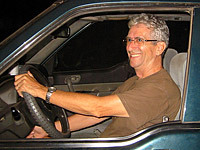 We have been driving on the left side for 14 months now and we have covered 30600 kilometers. For the rest of the trip we will drive on the right side. Cambodia gives us flashbacks from India. 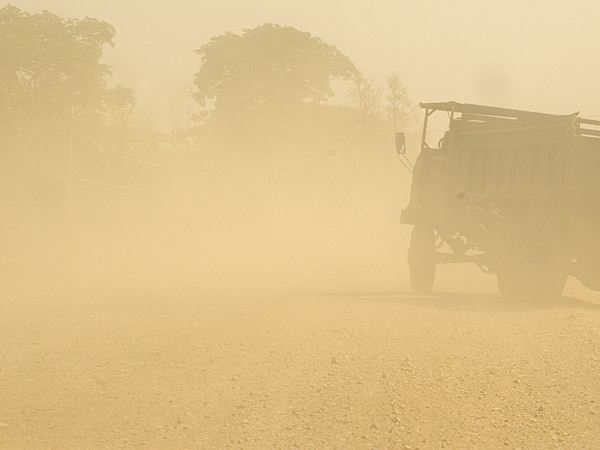 Dirty, dusty, litter everywhere, terrible road and people drive like maniacs, fast, ugly and use their horn all the time. We, who just had got used to a nice and civilized Thailand. The 140 kilometer trip from the border to Siam Reap took us eight hours to cover at the extremely bad and bumpy road. This means that we kept an average speed of 20 kilometers an hour!!!! The Russians are not to play with when it comes to bureaucracy. 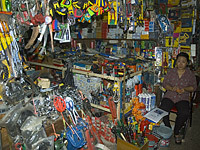 We are pulling our hair to get all things like time, places, hiv-tests, invitations to work out. We thought we had it under control already, but no. It is like a never ending story and it took us several hours to try to figure out how it works and send them long e-mails explaining what we want to do, how and when. In the afternoon we went to buy tickets for Ancor Wat tomorrow. We chose to take one day pass only, for 20 $US per person. During our long journey we have seen lots and lots of piles of stones. 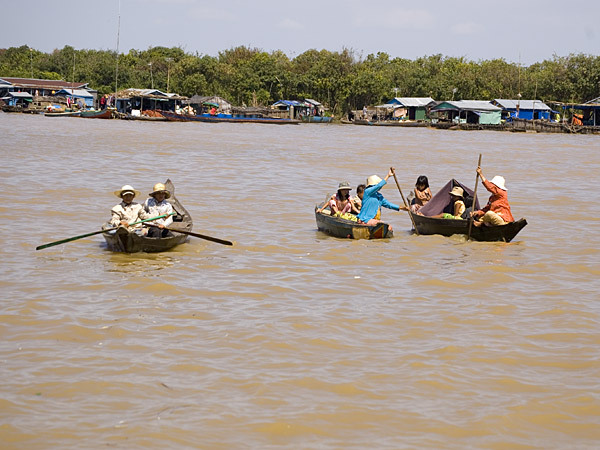 But since this is the Cambodian peoples pride and a world attraction, we felt obliged to at least pay it a visit. When we bought the tickets they informed us that we could go in for a free for a sunseth visit already today. 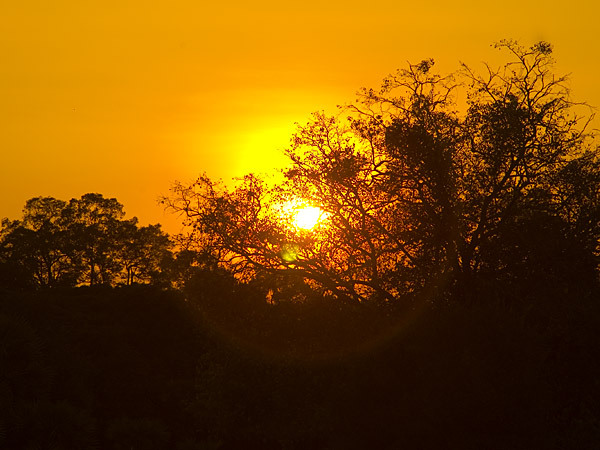 We got there just in time to see the sunseth at Ancor Wat. We also got the opportunity to check out where to go to see the sunrise tomorrow. 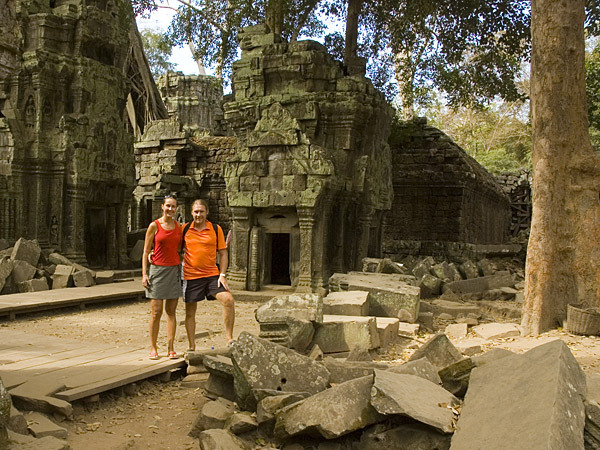 Ankor was built between the 9th and the 1300th century when the Khmer civilization was on its peek. 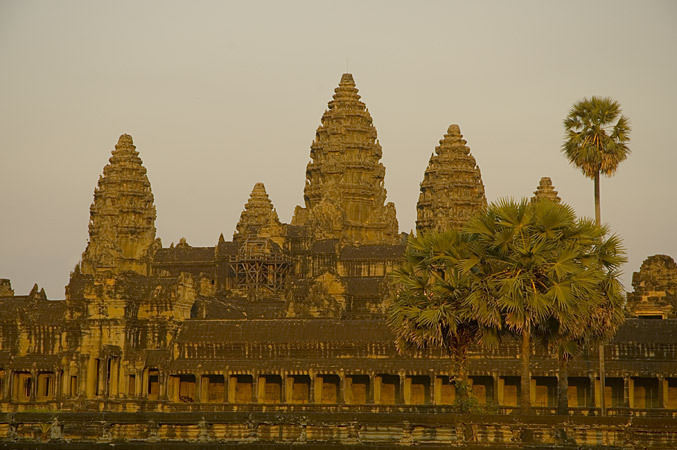 The kings ruled their empire from Ankor. 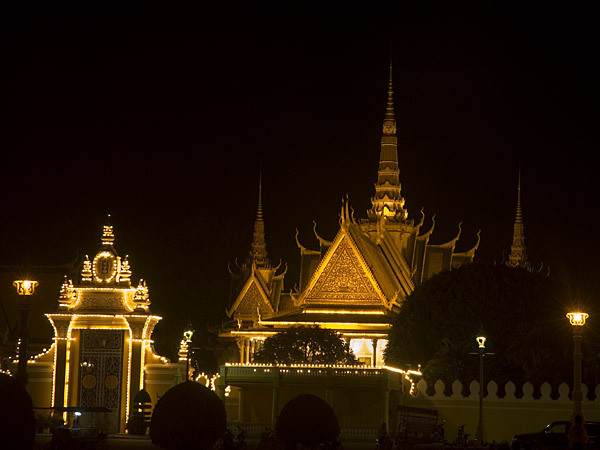 At that time the kingdom included apart from Cambodia also Vietnam, Thailand, Laos and the Yunnan province in China. There are hundreds of temples built out of stone in Ankor. 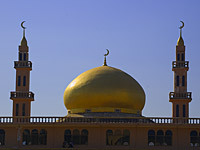 Construction material such as stone was only allowed for the gods. All the other houses, administrative buildings and palaces was made out of wood, and has long ago dissapered. If you have a keen interest in archeology there are lot to see here. But since that isn’t really our bag we chose only the three in our opinion most interesting temple sights to explore; Ankor Wat, Bayon and the cool Ta Prohm. 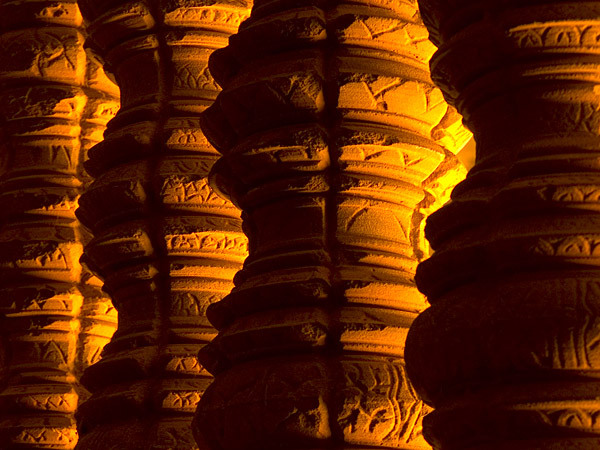 Ankor covers a vast area and there are several kilometers in between the temple sights. To walk around is not doable in the blazing sun, dust and the heat. 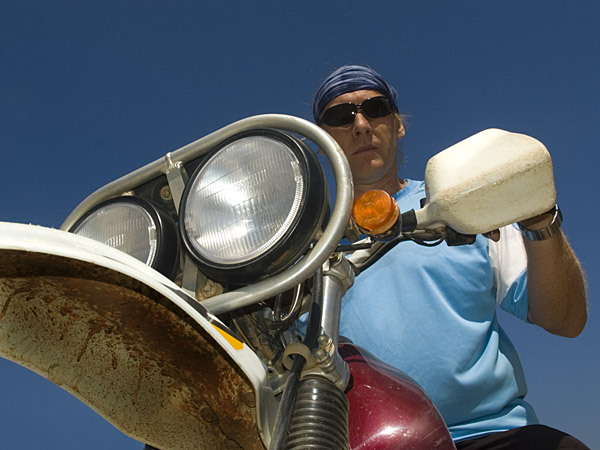 Most people take a Moto , rent a bike or go with a chartered bus trip. 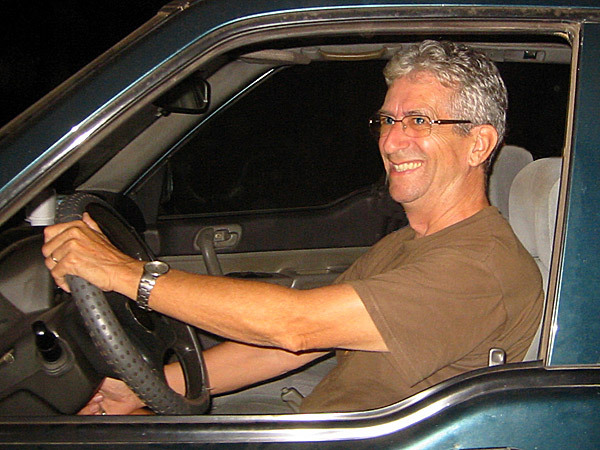 We took our car , and it was no problem at all for us to drive around in the Ankor area. Ankor Wat is the most famous temple of them all. 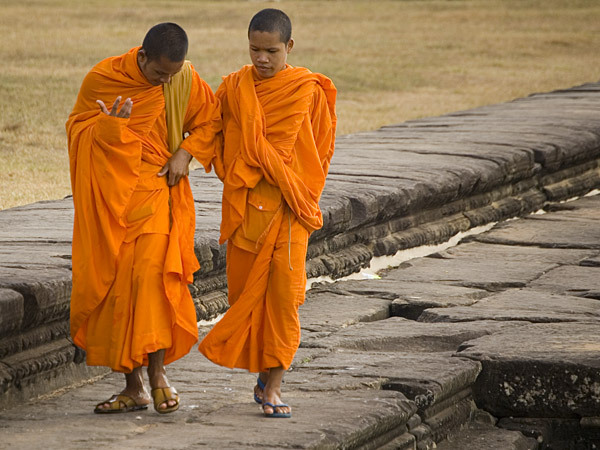 Everywhere we go in Cambodia we see photos of Ankor Wat. The Cambodians are so prod of it and it is their national tresure. In the middle of Ankor Thom is Bayon temple, with its 216 faces watching all visitors from all angles. At every single pinnacle four faces are cut out watching all four cardinal points. 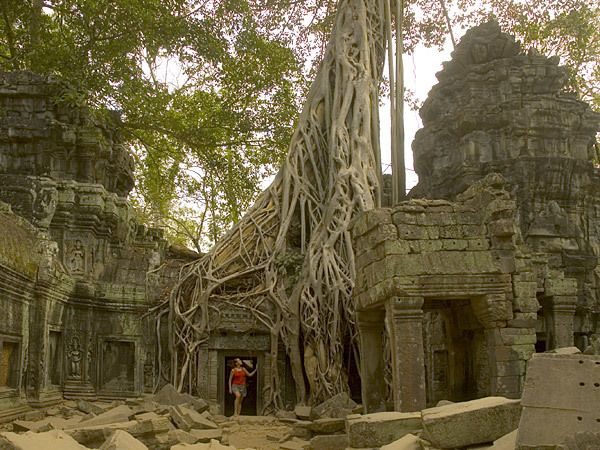 But coolest of all temple sights is definitely Ta Prohm. To be there is like being in an Indiana Jones movie. The temple still looks about the same as when the archeologists found it. They have only cut out a bit jungle to make it accessible for us tourists. The fat roots of the jungle trees have made their way in to the buildings making them fall apart. Everywhere we look we see torn down walls and warning signs about risk for collapsing structures. But this is by fast the most exiting sight of them all, kind of dramatic and fairy tail like. This is also the place where they shot parts of the movie Tomb Rider, with Angelina Jolie a few years ago. How about this conversation that occurred yesterday over a shaky Skype line. Hi Anders here, where are you? In Ankor Wat. Ankor Wat?! Where are you? 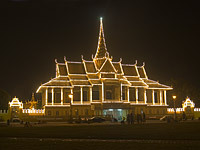 Ankor Wat. Ankor Wat? Yeah, in Ankor Wat. But where are you? 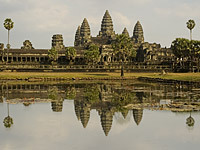 Ankor Wat. 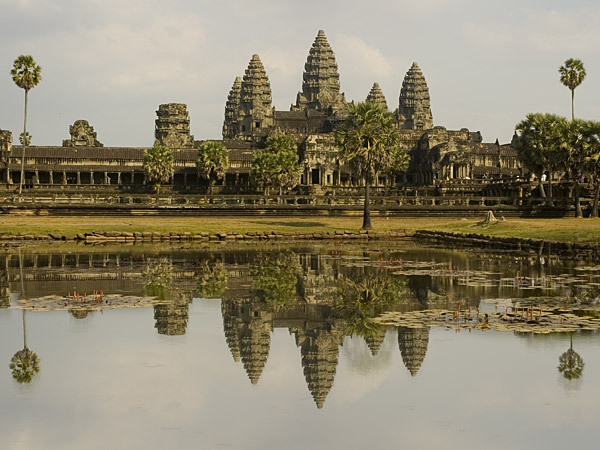 You maybe herd of Ankor Wat in Cambodia. Ahhh, you are in Ankor Wat! But, so am I! You are staying only 300 meter from my guesthouse, on the same road?! We had now idea our friend Anders Thorsell was going to be here. 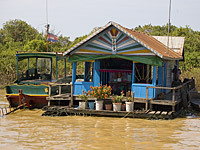 In the morning we went to Tonle Sap, the largest lake in South East Asia to take a look at a very nice floating village. There where so many photo opportunities we nearly over strained the trigger fingers. We rented a boat with a driver to take us around the village for 11 Euro. Bert even got to drive the boat for a while. 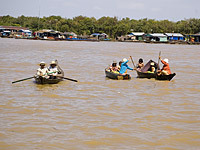 The floating village has 5 000 inhabitants, 3 000 is Cambodians, 1 000 is Vietnamese and 1 000 is Muslims. And the village has all that a 5 000 inhabitant need. Here we see floating schools , gym , cottage hospital, shaving shops, hardware store, food shops, churches churches and even a floating pigsty ! The people living here are poor. They live in small bamboo huts, looking like they will soon fall apart. 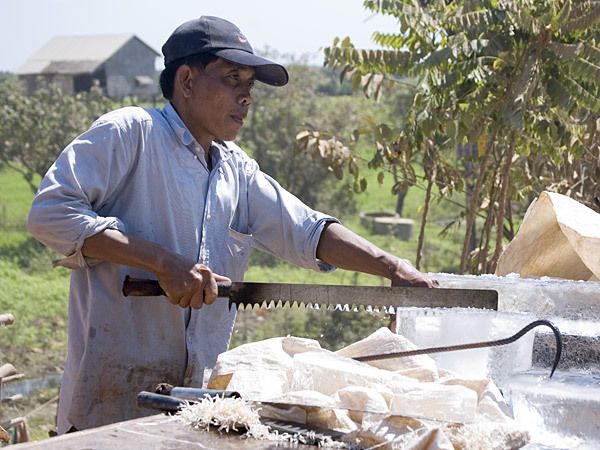 Guess we don’t have to mention that fish from the lake and rice is the main food. 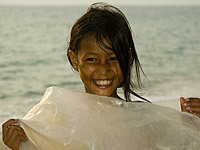 But we haven’t seen any beggar all day and people are friendly and smiling even though the lead a hard life here. When the children are going out the play in the “yard”, they in fact jump in the lake to swim over to their neighbor or they paddle their washing-up bowl. 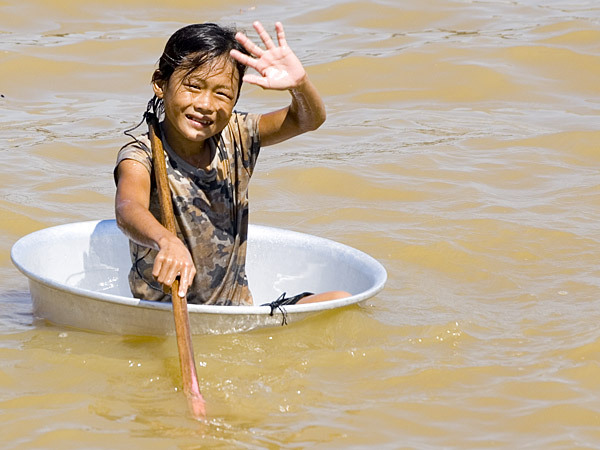 All kids we saw were paddling this kind of washing-up bowls. We had lunch by a rice paddy field before setting of for Phnom Phen, a 320 kilometer journey that took us five hours on the asphalt road. Much better than the eight hour trip to cover 140 kilometers on the road between the border and Siam Reap a few days ago. 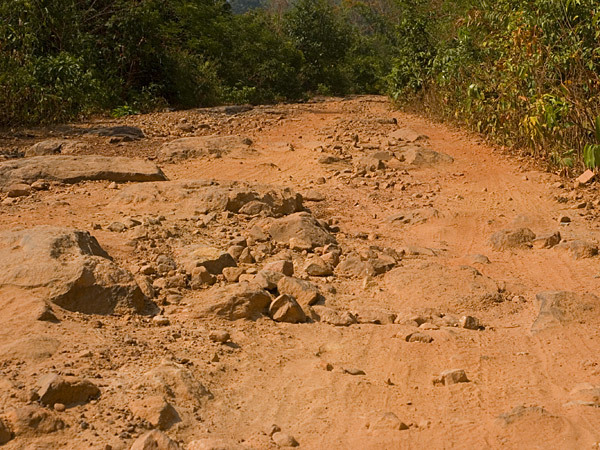 Rumor has it that airline carriers pay bribes to prevent Cambodia from improving that particular road. The air fare Bangkok – Siam Reap is said to be overpriced compared to other flights within Asia. If this is true or not, we don’t really know. 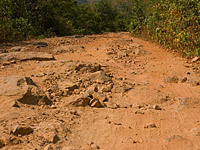 But no country, poor or not couldn’t possible allow a road to be in such a terrible state without a very strong reason – that’s for sure. To bring on Vietnam Embassy before breakfast was a bad idea. We should have known better. Embassy people are usually very trying - also in this case. To apply for a single entry tourist visa was a pretty strait forward process. The cost 21 Euro per person, and the processing time is four days. But four weeks will not be enough for us. In Hanoi we need to ask for a 14 days visa extension, at the immigration office. Right now we seem to have worse problem than that. 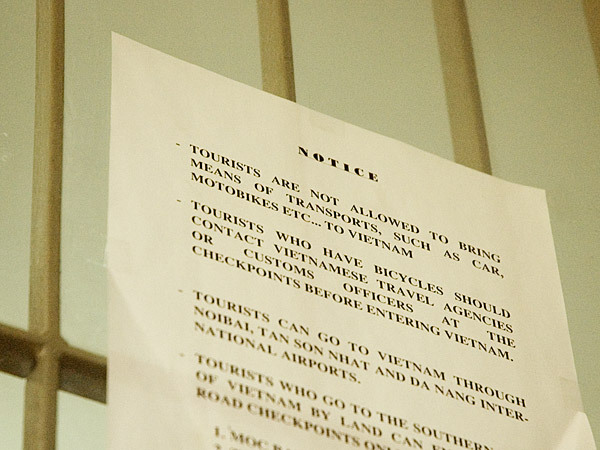 At the embassy we saw a flyer telling us no foreign vehicles are allowed in to Vietnam. Ohhh, no! 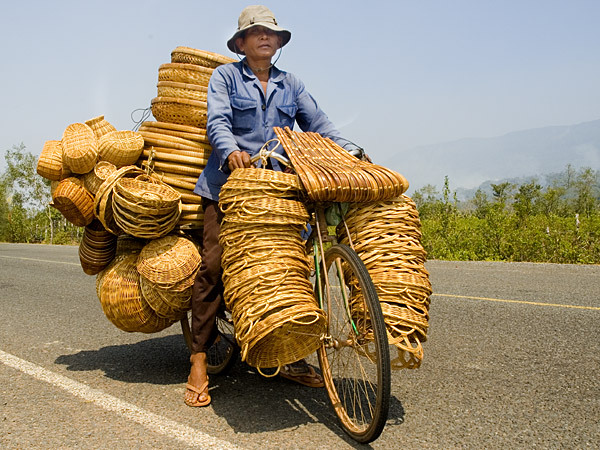 If we can not bring our car in to Vietnam we have a really bad situation on our hands. The China transit, four months of preparation and paperwork and 2500 Euro might go down the drain. 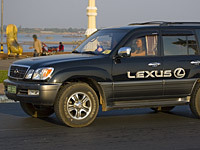 We questioned the flyer about the car, told them we had spoken to their embassy colleagues in Laos about it and that we had friends from Europe who hade been in Vietnam with their car less than six months ago. 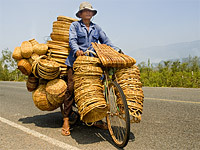 But the man just ignored our facts and said; “No, you can not bring your car in to Vietnam!”. When we tried to discuss it or get hold of someone with a higher rank than him, he got even angrier. The question is, what do we do know? We need to find a solution for this or make up a plan B. Maybe we need to rearrange our China trip, but we don’t know if that is possible when all the paperwork is already so far gone. We needed to give our brains a rest for a while. We took a walk around town checking out Old Market and Central market. When we came down to the river bank area we noticed a motorbike with Swedish plates. The next moment Kenneth from Gävle shows up. 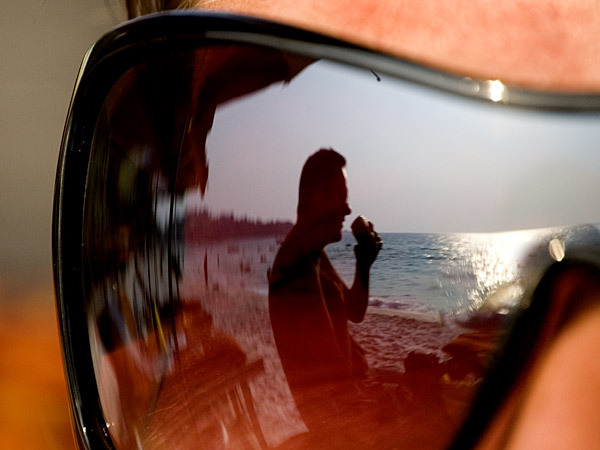 He is an ex boyfriend of Anneli, the girl who is meeting us in Vietnam in three weeks. 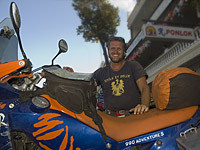 We had heard that he was planning to rid his bike from Sweden to Thailand this winter. And all of a sudden we run in to him in Phnom Pehn! Today we took a deep dive in to the dark history of Cambodia; the genocide and the terrible crimes committed by the Khmer Rouge? 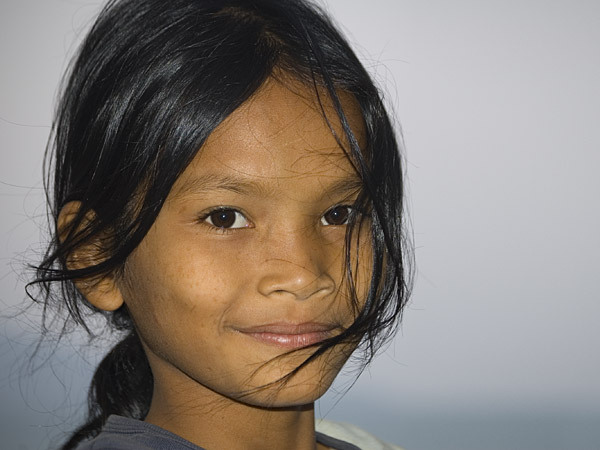 In 1975 the Khmer Rouge took over the power in Cambodia. 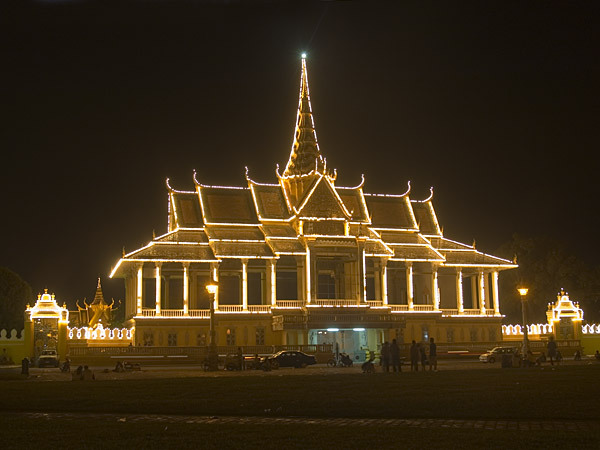 When arriving in Phnom Penh they where greeted as saviors and liberators. But soon the people realized that was not really the case at all. Within three hour the black dressed soldiers had emptied Phnom Penh from its citizens and they where driven out in the countryside to work in the fields, under miserable circumstances, starvation and threats form being imprisoned. 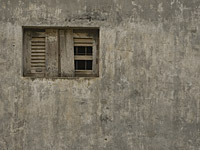 This was year zero in the new calendar of the Khmer Rouge. The leader Pol-Pot the Khmer Rouge destroyed all tings from the old society like cars, machines, buildings, temples etcetera and he also abolish the currency. The idea was to form a new communistic society of hardworking ignorant peasants, following every Khmer Rouge order without thinking for themselves. Then the persecution and jailing of intellectuals, regime critics, monks and suspect CIA spies started. During 1975-1979, 2 million Cambodians got executed, that means nearly on third of the population! 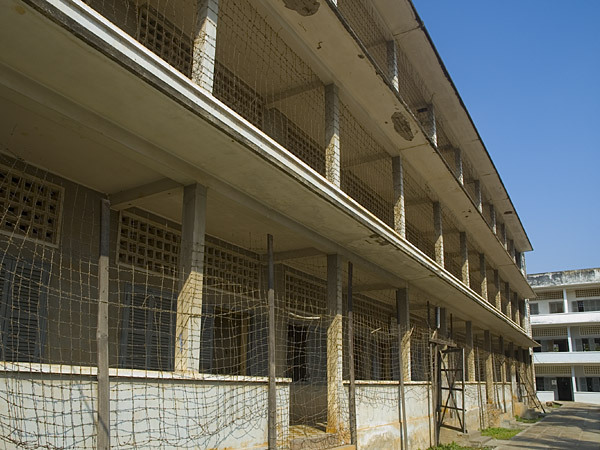 In the ghost town of Phnom Penh a high school was rebuilt to form Cambodia’s worst prison for interrogation and torture – Tuol Sleng, or ”Security Office 21” as it was also called. 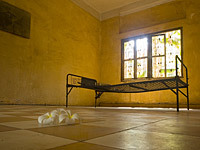 12 000 men, women and children was jailed, interrogated, tortured and killed here during the four year of Khmer Rouge regime. The ones who died during torture were buried in mass graves at the prison. 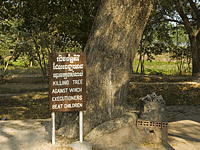 Those who survived the torture were taken to the nearby Killing Fields to be executed, and put in the mass graves there. 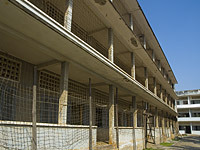 The prison is divided in several units. 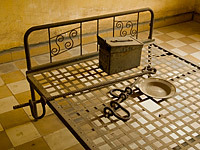 There are some large one person torture cells with iron beds for to Khmer Rouge important prisoners. But most rooms are small cells of 1 x 2,5 meters. On the top floors there are mass detention rooms . The prisoners lie shackled and nearly naked on the floor, and the floor is completely packed with bodies. 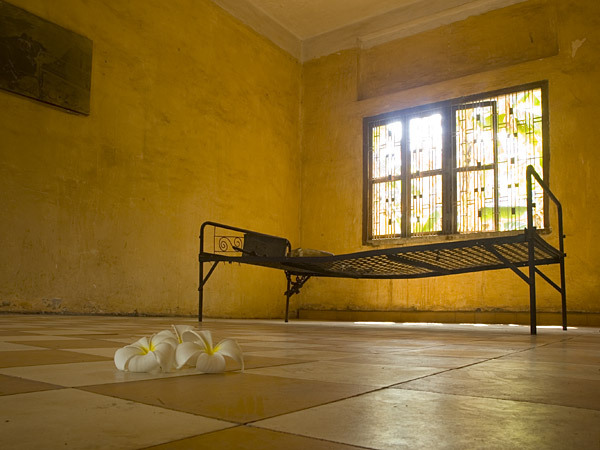 Khmer Rouge kept close records of the prisoners. But most achieves disappeared when the Khmer Rouge lost the power and went underground in 1979, when the Vietnamese invades the country. 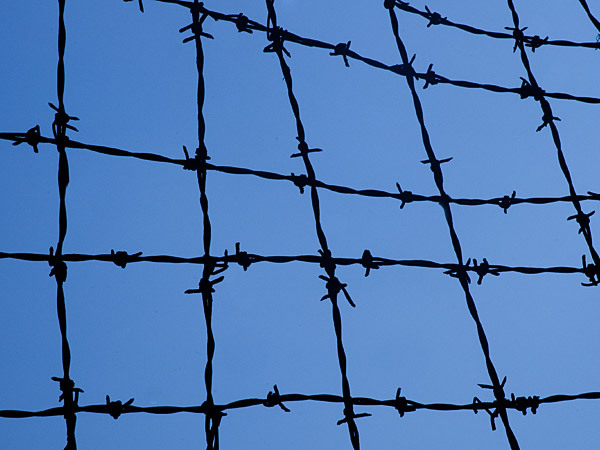 The prisoners had to pee in plastic bottles and use ammunition boxes to empty their bowels. If they where lucky they got to wash themselves one a week. We can just imagine what the smell of urine, sweat, blood and dirt was like. But we guess that was a minor problem to them. The torture was terrible. The paranoid haunt for CIA spy’s and regime critics had no limit. 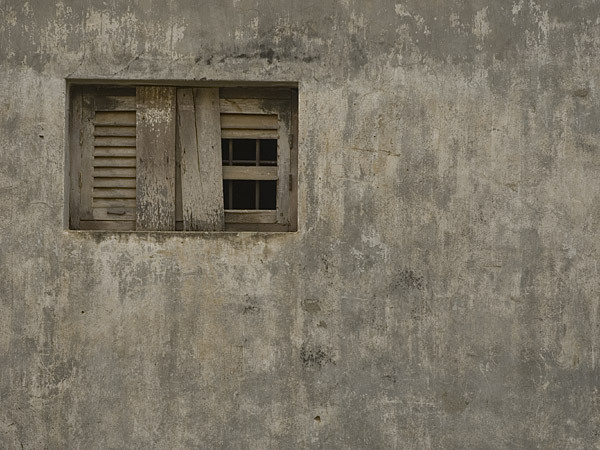 The artist who painted these pieces was one of seven to survive Toul Sleng. 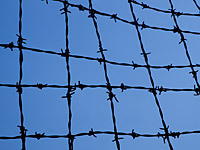 After the liberation he painted from his memory the torture when they pulled out the victims nails, water torture, electric shocks, maltreatment and when they rip the children out of the hands of the mothers . 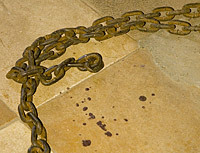 Here and there we can still see the blood traces from the torture. 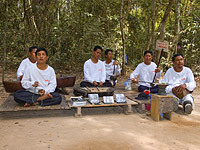 It was to Choeung Ek or Killing Field as it is also called, the blindfolded prisoners where transported to get executed. They where left standing by the mass grave and hit on the back their head. If they didn’t die when they fell down in the grave, another man was standing in the grave cutting their throats. It was out of economic reasons they used a bat and a knife to execute the prisoners instead of a shot gun. Killing Tree was used to kill infants. They took them by their feet and hit them at the tree until they were dead. Then they where throw in the mass grave together with the dead body of their mother. The mass graves are like big crates in the landscape. Everywhere pieces of clothes are sticking out of the ground from the victims clothing. We try no to step on it as we are walking though the field. 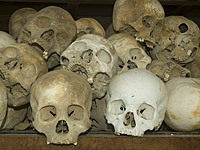 At Killing Field there is a memorial building for the two million who was killed during the Khmer Rouge regime. Inside the memorial building there are 8 985 skulls from the 129 mass graves found here at the Killing Field. Our guide was only 14 years old when all this happened. 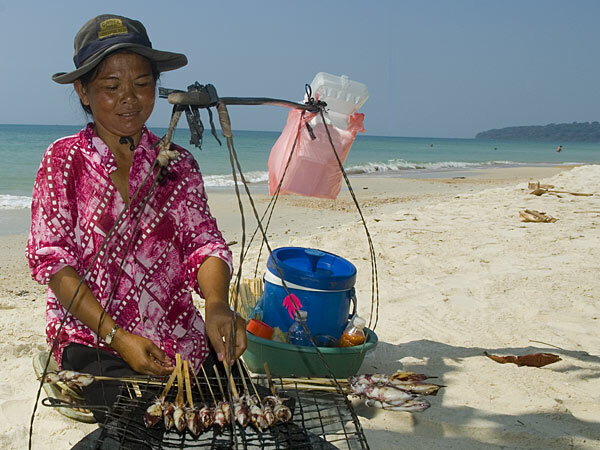 She and her family was living in Phnom Penh in 1975, and got deported out in the countryside close to Thai border. Today only she and her mother is still alive. 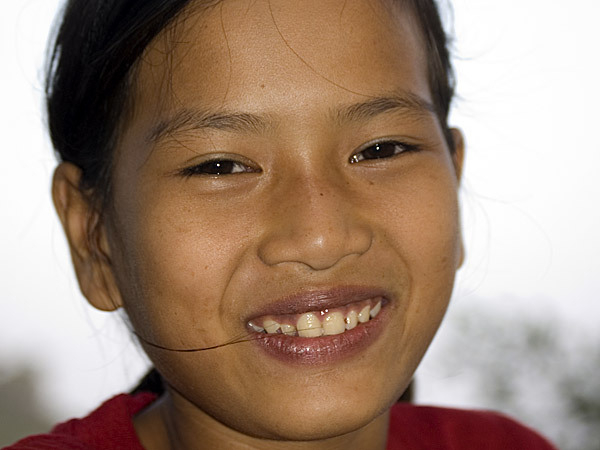 Her father and brothers got executed by the Khmer Rouge. At the Russian market you find absolutely everything. 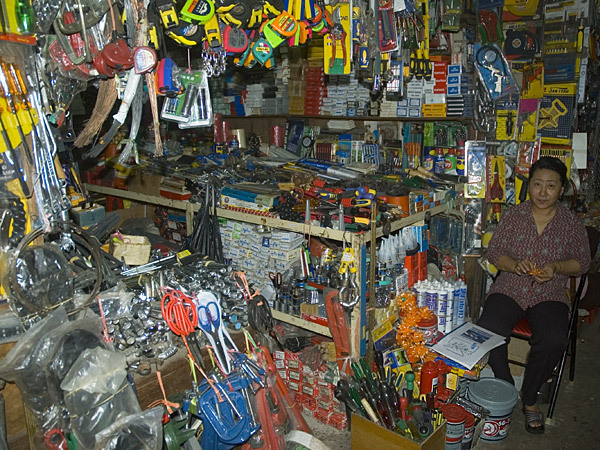 This means things that Bert is interested in too, like a scale for gas bottles, tools and DVD:s.
After that we took a tour down the riverlittle girl selling book s that he persuaded with a dollar bill to pose for him. Reluctantly she did. 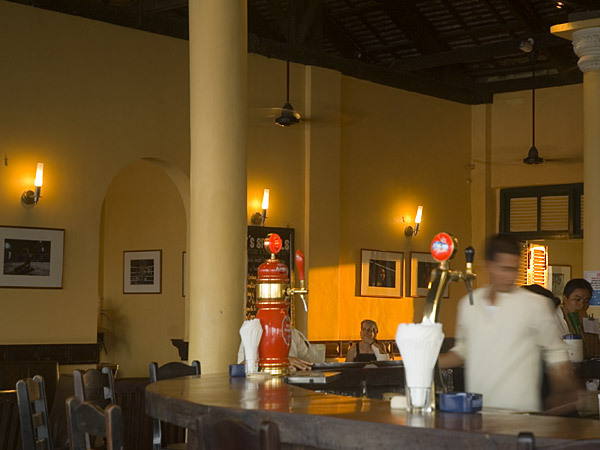 The FCC – Foreign Correspondents Club is a great colonial style restaurant and bar. We sat at the balcony, saw the sun go down sipping a Pastis and watching the street life. 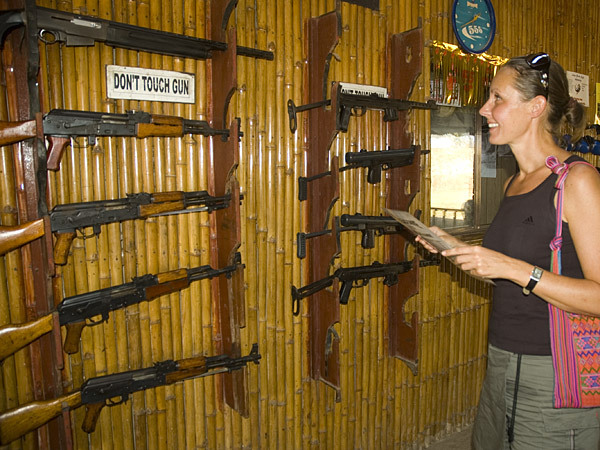 Think about going to a Shooing Range and sit down at a table to choose a weapon from a menu. It was exactly like that. 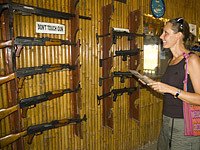 Here you can shoot everything like guns, machine guns and throw hand grenades. 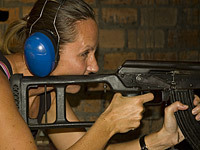 Catharina was the first one to shoot . She was prepared for the kick – but not for the sound. When her first shot went off she jumped half a meter, dropped the Kalasnico and started to laugh like crazy . The shots were very loud even though we wore earmuffs anf the grease sprinkled our face. But still, it was fun to try it and 10 shots were quite enough for Catharina. Now it was Berts turn, he took the rest of the shots. Since he did one year of military service it wasn’t that big of a happening too him. But he enjoyed to try a Russian Kalasnico and to use real shots instead of blanks. The shooting range was 45 meters. We did a pretty good job both of us. When inspecting Catharinas and Berts targets we realized we actually hit the target most of the times. It was not easy to find this place. 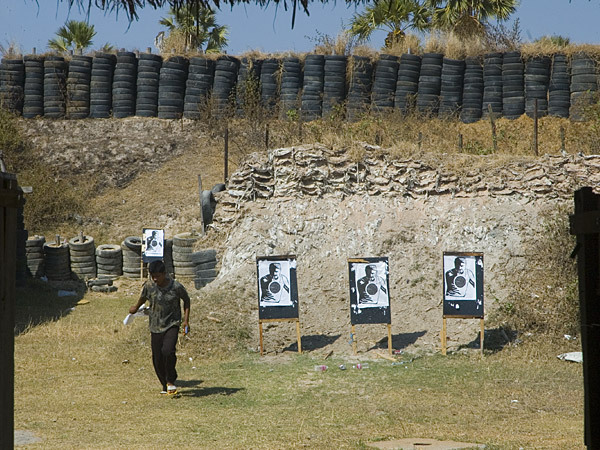 It is said to be four shooting ranges in the Phnom Penh area. They are kind of secretive. 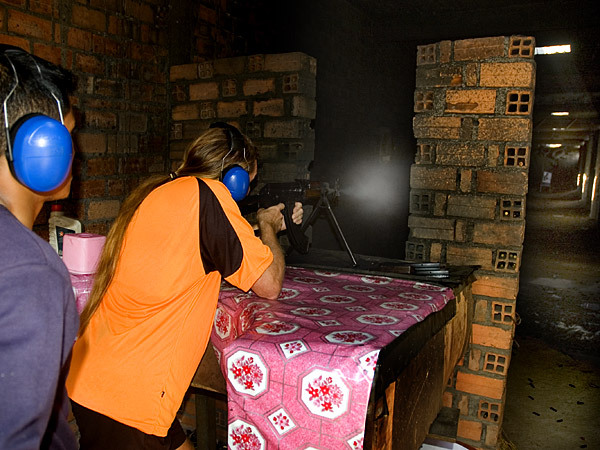 A few years ago the shooting range business was banned. After that only a few people know where you still can do it. And there are no signs at all. Finally we found a liquor smelling soldier who could show us the way, get us passed the guard in to the Air Borne Forces military base – where the shooting range were to be found. This is a sick thing to do. But, still it is really fun too try it! At 10 AM we picked up our Vietnamese visa. 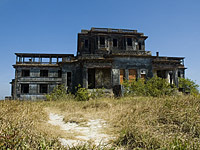 After that we headed south towards the ghost town of Bokor. 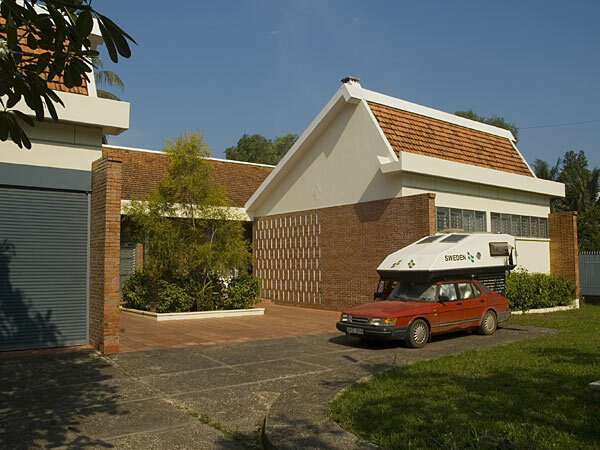 During the French colonization it was a cool, luxurious hill resort. But that was back then, and it has been abounded since many years now. When we took the side road to Bokor, a car stopped and our friend Anders Thorsell jumped out! 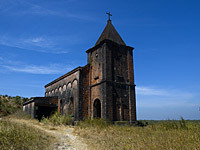 He had just been up in Bokor, and told us that we could not possibly go there with our SAAB. But since we already were there we wanted to give it a try. Oh lord, what a terrible road. It looked more like a dried out flood stream than a road. To travel that would be like a kamikaze mission, and it would be very likely that we damage our car real bad. No, it was not worth the risk. We continued to Sihanoukville instead. Arriving there we got shanghaied by a crazy Frenchman. He told us we just had to stay in his garden. We thought, well why not? We have got to stay somewhere. 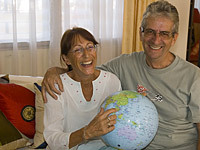 It is really great to stay with Jaques and Anne. Since they are also overland travelers they know exactly what we need and appreciate. At their house our car is safe, we have a toilet and a shower. This morning Anne asked us if we had any laundry that had to be done. Great! 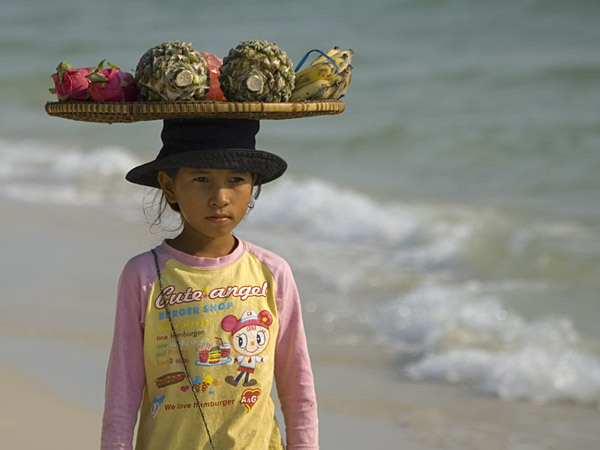 Even if the security situation in Cambodia has improved one still have to be careful. Jaques and Anne told us that it is not safe at all to park for the night at the beach or wild camp elsewhere where you are all alone. It is great to arrive in a new place. 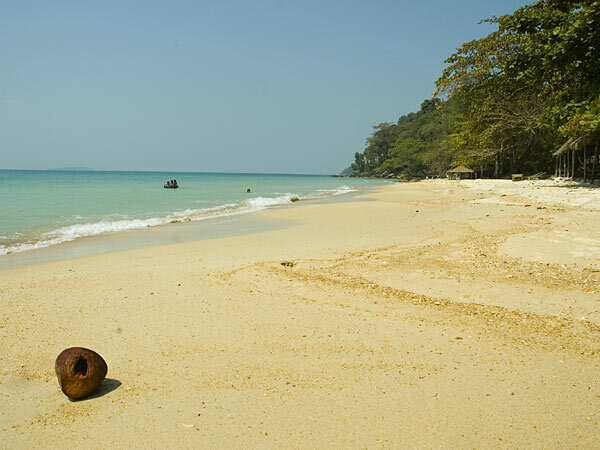 We took three hour walk around the beaches of Sihanoukville in the blazing sun. 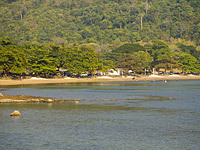 We walked all the way from Victory Hill, where we live passed Independence Beach , onwards to Ochheuteal Beach and Otres Beach. In the evening we where invited to dinner at Jaques and Annes. Only eight moths ago they made about the same trip as we are going to do across China , Mongolia and Russia. We got a lot of information about the route from them. They also gave us their old Russia and Mongolia maps. Great! 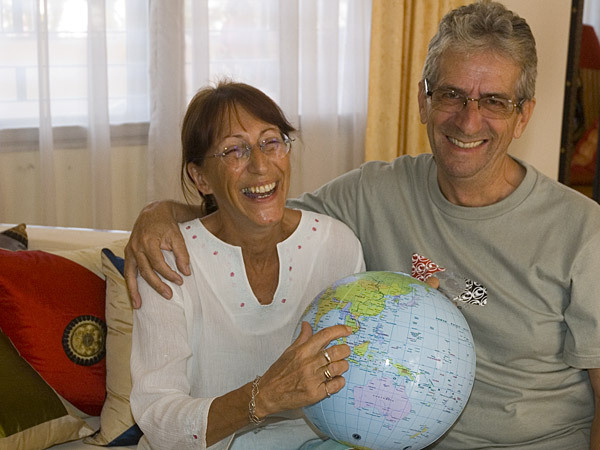 We are so happy to meet them, especially now before we are going there. We decided to meet out friend Thorsa at Ochheuteal Beach. 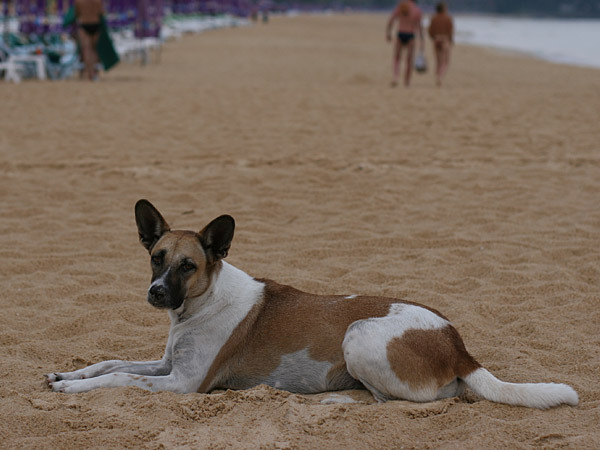 He showed up here in Sihanoukville yesterday afternoon. Ochheuteal Beach is definitely the most crowded beach of them all, and there are surprisingly many Swedish tourists here. 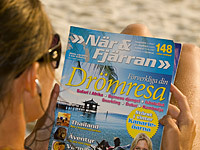 In the afternoon we decided to go to the less crowded and nicer Indipendance Beach. In the evening Thorsa the party animal lured us in to the shame district. The bar girls were surprisingly uninterested in Bert and Thorsa – but completely crazy about Catharina . What is going on ? We didn’t understand a thing! 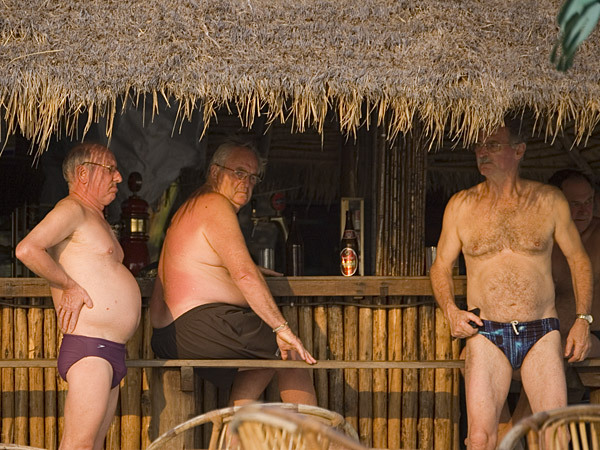 But one lady man was very envious about Bert’s long thick, blond hair . We had quite a few Pastis and beer, played pool and had a great evening ! Woke up with a really bad hang over, it took us most of the day to return to normal. It is not wise to leave the paths or roads in Cambodia. 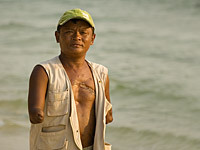 Everywhere we see people that have gotten severely injured by land mines. Cambodia is still packed with land mines since the times of the Khmer Rouge. 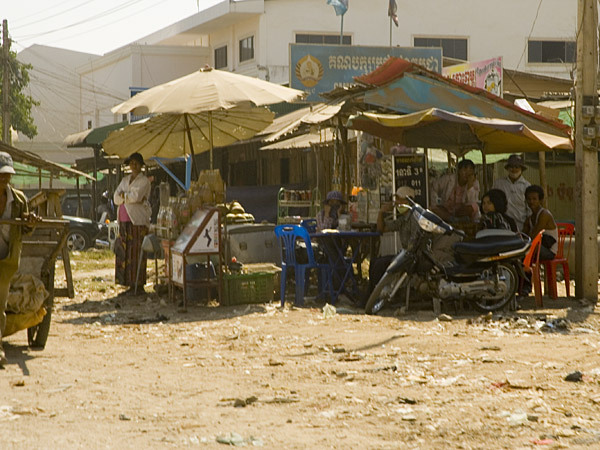 The other day we spoke to an Australian guy working for a company that are here to tech Cambodians to defuse mines. He told us that there are no maps or register telling them where to find the mines. They try to get hold of the Khemer soldiers that put the mines in the ground in the first place, to get help from them finding out where they are hidden. But it is a dangerous job. A few days ago seven people of the defuse crew got killed when the ground completely exploded under their feet. It is Bert´s birthday today. Now he just has one more year to go until he turns 50! Today we had half a day with at the pool, while Throsa was waiting for his fancy hotel room. It is great for us poor overland travlers to use the pool and shower at the nice hotels where our “rich” friends are staying. The afternoon we spent at the beach. Soon it will be the end of beach life for us too. 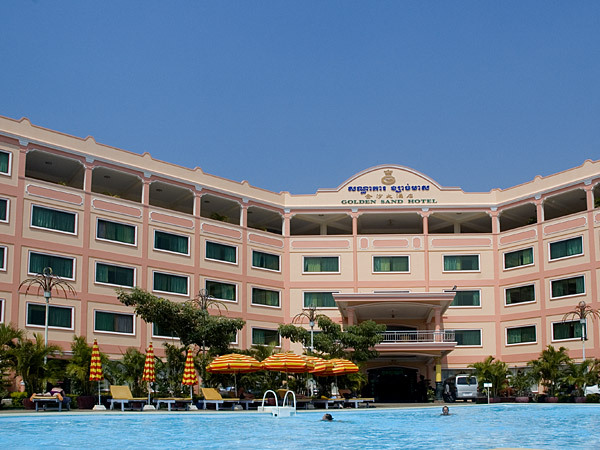 We will have a few weeks in southern Vietnam. After that the climate will be a much cooler for the rest of the trip. In the evening we went to the outdoor cinema at the Bungalow Village, to see the movie Borat. Completely crazy movie, but absolutely hilarious! 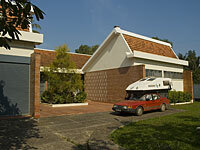 Today we hit the road again after saying our goodbyes to Jaques and Anne. 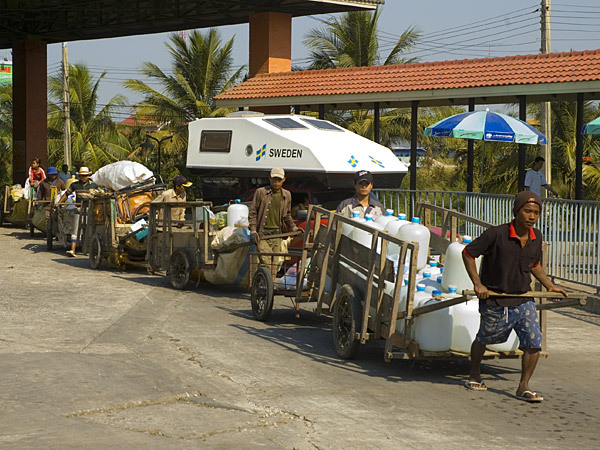 We didn’t go too far, only 150 kilometers east along the coast to Kep. 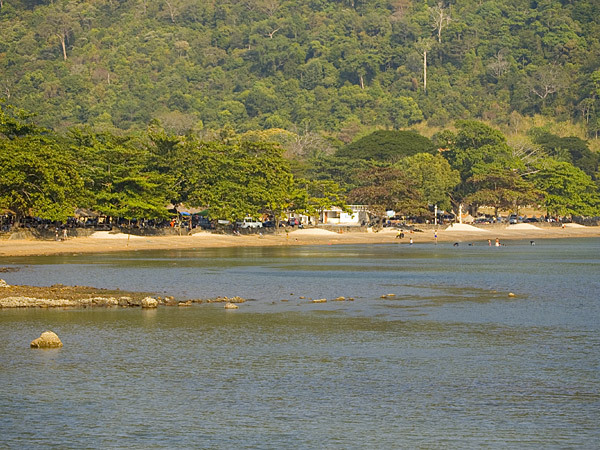 Since we didn’t think Kep was such a great place we decided to stay the night in Kampot instead, a bit closer to Bokor where we are going tomorrow. 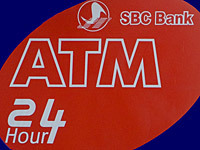 All guide books tell us that there are no ATM machines in Cambodia. That is not true at all. At least in all big cities you have no problem at all finding one. 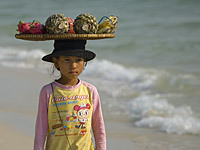 The money is a strange thing in Cambodia. The currency in Cambodia is riel. But when we make a withdrawal at an ATM machine - we get American dollars, only. All prices are set in American dollars. We always pay in dollars. The change we get is usually a mix of dollars and riel. Riel is instead of cent coins here in Cambodia. Strange isn’t it? When we woke up this morning it was only +20°C! Can not even remember when we had a night this nice and cool. 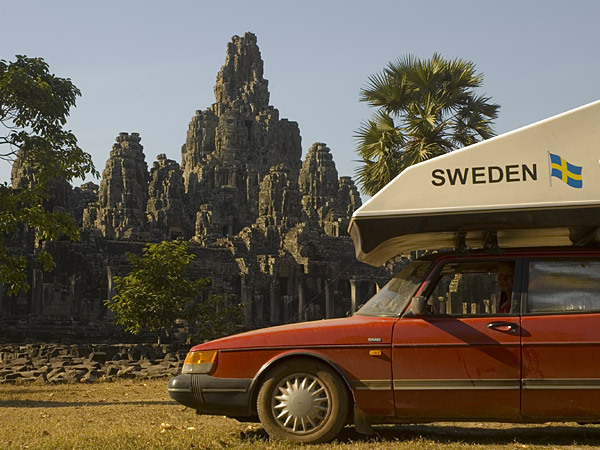 Today we gave Bokor another shot, this time by dirt bike instead of our precious SAAB. 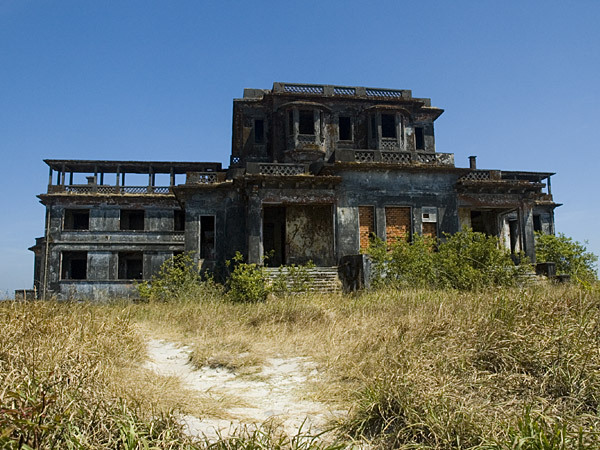 But Bokor was really disappointing. 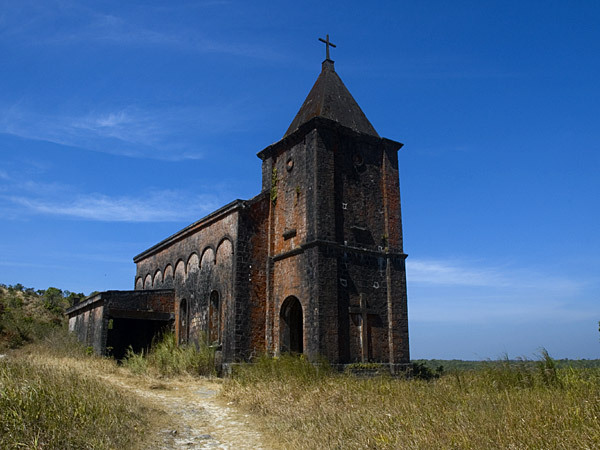 We expected a ghost town with a casino, luxury hotel and a catholic church. We thought it would be like an abounded town, left as it once where, but all we found was an ugly former hotel and a church. The benefit of the day was the very bumpy journey up and down the hill. The altitude of the hill station was 1080 meters. It was fun to go by dirt bike over rocks, stones and through sand. Traveling two persons at one bike didn’t make it any easier. We where close to fall over several times in the difficult terrain. After the four hour journey our bums where quite sour. But it was great fun! 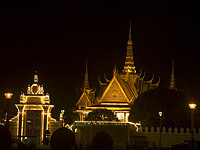 We are now back in Phnom Penh. 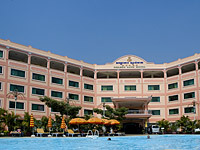 Our visa for Vietnam does not start until February 1st. 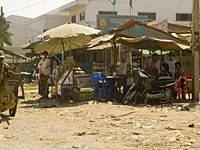 We decided to wait one day in Phnom Penh before heading for the border. 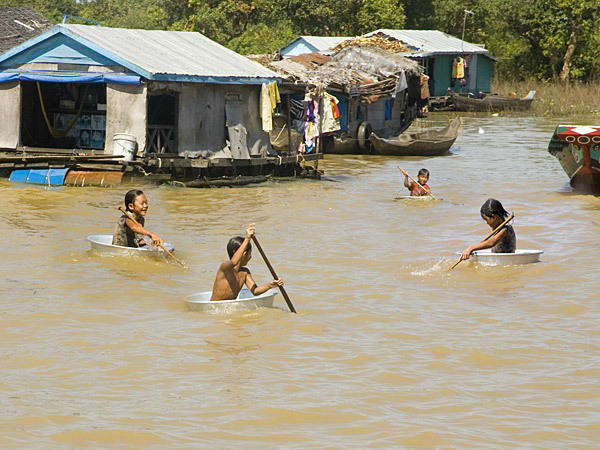 Cambodia in not even a struggling democracy. Even if they already have had so called democratic elections, they are not democratic at all. 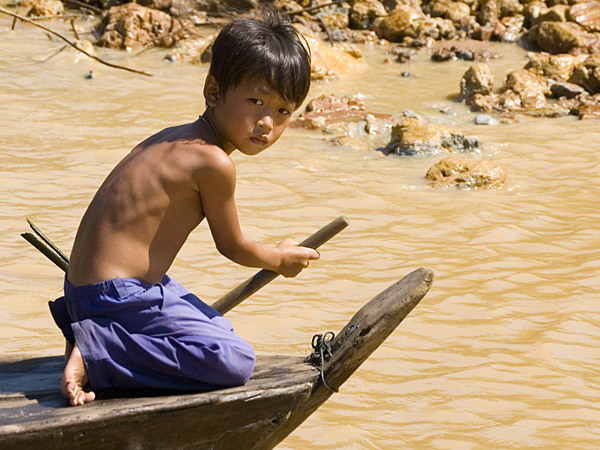 The Cambodian Peoples Party rules the country with a rod of iron. If someone wants to vote the opposition party they have to go register at the Cambodian Peoples Party office. This means everyone knows who is voting for whom, and the CPP makes life difficult for those who dare to make their voice heard by voting opposition. What we call a pajamas women wear in the streets. It looks funny too us. There are no question that they wear a pajama, because the prints are all teddy bears and comics. Today we went all the way to the border to park for the night. We want to get an early start tomorrow as we are expecting a bit of a hassle at the border. 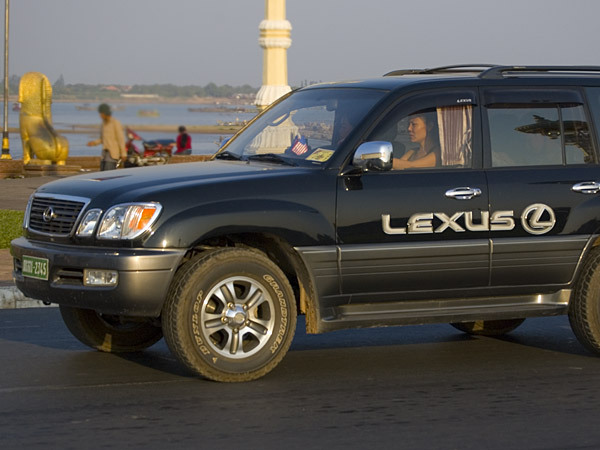 The default answer is a big NO, at question of bringing a western car in to Vietnam. But after some arguing we will need to leave the car at the border to take the bus the closest town where they have a provincial police station. There we have to collect a permit that takes a few days to arrange. After that we can go back to the border to bring our car in to the country – we hope.